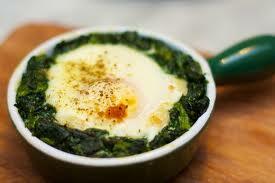 Spinach and egg breakfast nests. Wilt the spinach in a heated saucepan. Place spinach into an oven proof dish. Make into three birds nest shapes (using a small dish or muffin moulds can help) and crack an egg into each one. Sprinkle black pepper and sesame seeds onto top of egg. Bake in oven (180°C) for 15 minutes or until eggs are set. Variations: Add cooked onion and garlic, top with a slice of fresh tomato, or sprinkle with dried herbs or spices such as paprika.